He said his party had started a nationwide mobilisation tour and would give a "signal" for people to converge in Harare to push Mnangagwa out. "Beitbridge is the first port of call, but we will embark on a national tour to tell people to be ready," he said. "We are planning to have the people's vote respected. "We won the election on the ground and it was stolen, but the economy's performance is testimony to what happened." Chamisa said he would not congratulate Mnangagwa because the president was not "legitimately elected". "You must ride on top of those trucks bringing flour into the country. You must find ways to get to Harare when we give the signal," he said. "The people's vote must be respected. I had garnered 2,6 million votes when they decided to steal the election, but they cannot steal the economy. "They have no clue, they have parked because they can no longer drive the country, but give me two days and I will make it work." Chamisa was in Beitbridge on what his party called a "thank you" rally for people who voted for him and his local government team. 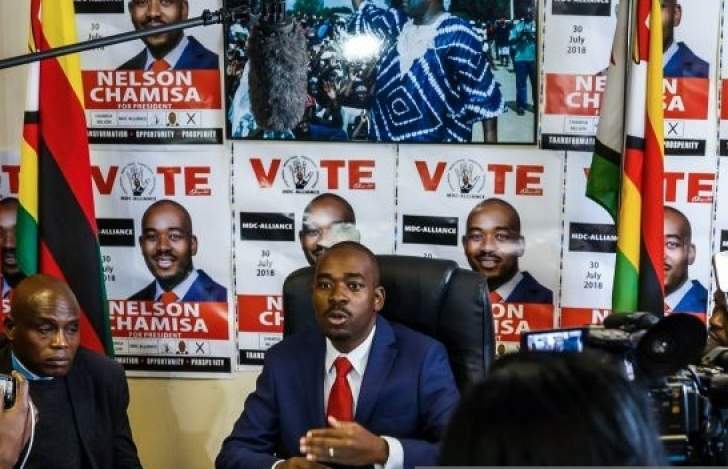 "We have a crisis of legitimacy, there is a crisis that people decided to go against the choice of the people," Chamisa said. "I have refused to be swallowed. They are inviting me, but I don't want them to do what they did to our founding leader Morgan Richard Tsvangirai," he said. "They must go out and I take over as they become the opposition." There was violence during the hearing after a Zanu-PF sympathiser mocked Gukurahundi victims. "Mthwakazi boys gave them a lesson," Chamisa told the rally. "The whole country saw the soldier who knelt down shooting civilians and he should just be arrested. Why should resources be wasted as if he is unknown?" Chamisa said the country now required nation-building and reconciliation which his party could easily administer because it had the people's blessings. He said the Zanu-PF government was bound to fail because it built its foundation on a corrupt crop of leadership where those who stole the most were the most rewarded. Chamisa, who brought along former Joice Mujuru's National Patriotic Party's strongman Dzikamai Mavhaire, paraded a number of war veterans from both Zipra and Zanla. "You must shun corruption, work towards achieving a city, have an international airport, good roads and good service delivery to achieve city status within your term," he said. "Beitbridge, you started with Tajamuka, let's now go and remove Mnangagwa who has spoilt our lives," said Chidziva. Mnangagwa recently told a Zanu-PF central committee meeting that Zimbabweans must ignore the MDC Alliance calls for protests and concentrate on rebuilding the economy.